In the early hours of March 24, 1999, NATO began the bombing of what was then the Federal Republic of Yugoslavia. For some reason, many in the targeted nation thought the name of the operation was "Merciful Angel." In fact, the attack was code-named "Allied Force" – a cold, uninspired and perfectly descriptive moniker. For, however much NATO spokesmen and the cheerleading press spun, lied, and fabricated to show otherwise (unfortunately, with altogether too much success), there was nothing noble in NATO’s aims. It attacked Yugoslavia for the same reason then-Emperor Bill Clinton enjoyed a quickie in the Oval Office: because it could. Most of the criticism of the 1999 war has focused on its conduct (targeting practices, effects, "collateral damage") and consequences. But though the conduct of the war by NATO was atrocious and the consequences have been dire and criminal, none of that changes the fact that by its very nature and from the very beginning, NATO’s attack was a war of aggression: illegal, immoral, and unjust; not "unsuccessful" or "mishandled," but just plain wrong. Some NATO members tried to offer justification. London claimed the war was "justified" as a means of preventing a "humanitarian catastrophe," but offered no legal grounds for such a claim. Paris tried to create a tenuous link with UNSC resolutions 1199 and 1203, which Belgrade was supposedly violating. However, NATO had deliberately bypassed the UN, rendering this argument moot. The attack violated other laws and treaties as well: the Helsinki Final Act of 1975 (violating the territorial integrity of a signatory state) and the 1980 Vienna Convention on the Law of Treaties (using coercion to compel a state to sign a treaty – i.e., the Rambouillet ultimatum). 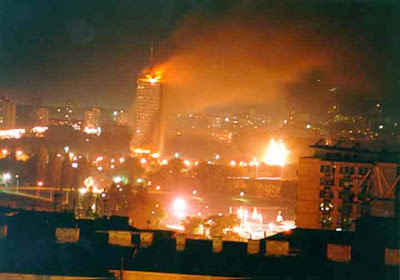 Yugoslavia had not attacked any NATO members, nor indeed threatened the security of any other country in the region; it was itself under an attack by a terrorist, irredentist organization. What NATO did on March 24, 1999 was an act of aggression, a crime against peace. Perfectly aware that the bombing was illegal, NATO leaders tried to create justifications for it after the fact. They quickly seized upon a mass exodus of Albanians from Kosovo, describing it as "ethnic cleansing" and even "genocide." But as recent testimonies of Macedonian medical workers who took care of Albanian refugees suggest, the Western press was engaging in crude deceit, staging images of suffering refugees and peddling the most outrageous tall tales as unvarnished truth. Stories abounded of mass murder, orchestrated expulsions, mass rapes, seizure of identity papers, even crematoria and mine shafts filled with dead bodies. Little or no evidence was offered – and not surprisingly, none found afterwards. The stories were part of a Big Lie, aimed to justify the intervention, concocted by professional propagandists, and delivered by the KLA-coached refugees. The KLA ran every camp in Macedonia and Albania, and there are credible allegations they organized the exodus in many instances. Albanians who did not play along were killed. Eventually, the "genocide" and other atrocity stories were debunked as propaganda. But they had served their purpose, conjuring a justification for the war at the time. They had allowed NATO and its apologists to claim the war – though "perhaps" illegal – was a moral and legitimate affair. But there should be no doubt, it was neither. Even if one can somehow gloss over the illegal, illegitimate nature of the war and the lies it was based on, would the war still not be justified, if only because it led to the return of refugees? Well, which refugees? Certainly, many Albanians – and quite a few from Albania, it appears – came back, only to proceed to cleanse Kosovo systematically of everyone else. Jews, Serbs, Roma, Turks, Ashkali, Gorani, no community was safe from KLA terror, not even the Albanians themselves. Those suspected of "collaborating" were brutally murdered, often with entire families. According to the Catholic doctrine of "just war," a war of aggression cannot be just. Even if one somehow fudges the issue, "the use of arms must not produce evils and disorders graver than the evil to be eliminated." The evil conjured by NATO’s and KLA’s propaganda machine was indeed grave. But it was not real. In contrast, what took place after the war – i.e., under the NATO/KLA occupation – is amply documented. At the beginning of NATO’s aggression, there were fewer dead, fewer refugees, less destruction, and more order than at any time since the beginning of the occupation. NATO has replaced a fabricated evil with a very real evil of its own. What began six years ago may have been Albright’s War on Clinton’s watch, but both Albright and Clinton have been gone from office for what amounts to a political eternity. For four years now, the occupation of Kosovo has continued with the blessing – implicit or otherwise – of Emperor Bush II, who launched his own illegal war in Iraq. Kosovo is not a partisan, but an imperial issue; that is why there has been virtually no debate on it since the first missiles were fired. Six years to the day since NATO aircraft began their onslaught, Kosovo is a chauvinistic, desolate hellhole. Serbian lives, property, culture, and heritage been systematically destroyed, often right before the eyes of NATO "peacekeepers." Through it all, Imperial officials, Albanian lobbyists, and various presstitutes have been working overtime to paint a canvas that would somehow cover up the true horror of occupation. Their "liberated" Kosovo represents everything that is wrong about the world we live in. It stands as a monument to the power of lies, the successful murder of law, and the triumph of might over justice. Such a monument must be torn down, or else the entire world may end up looking like Kosovo sometime down the line. If that’s what the people in "liberal Western democracies" are willing to see happen, then their civilization is well and truly gone.